Marvel Studios president Kevin Feige states that he won't move Captain America 3's release date just because it's hitting theaters the same day as DC's Batman v Superman: Dawn of Justice. Earlier this year, Marvel announced the release date for Captain America 3. While it's still a good two years away, it's now set to meet DC's big superhero crossover film, Batman v Superman: Dawn of Justice, head-on come May 6, 2016. So, is Marvel thinking of changing the release date for Captain America 3 to avoid cannibalizing each others' ticket sales? Well, apparently not. 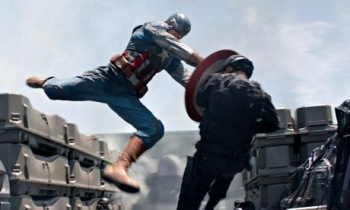 In an interview with Empire, Marvel Studios president Kevin Feige states they're not changing Cap 3's release date just to avoid pitting it against DC Batman v Superman, and are ready for a superhero showdown come 2016. I continue to be all for quality entertainment for moviegoers to enjoy on weekends...If it is on the same weekend, I enjoy it slightly less. But we are doing what we've always done, which is sticking to our plan and sticking to our vision for the movies going forward and we have a very large vision that we're working on for 'Cap 3' and for all the threes movies and just because another movie plops down onto one of ours, doesn't mean we are going to alter that. Maybe we should, but we're not going to. Have you decided which film you'll be watching that day? Which film should move its release date to avoid getting smashed by the other? Sound off and let us know. In the meantime, check out the top 10 characters Bob "MovieBob" Chipman would like to see in Captain America 3.